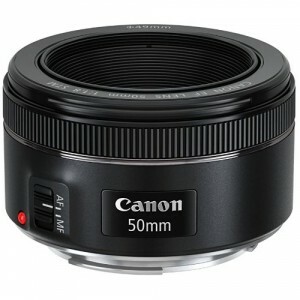 The Canon EF 50mm f/1.8 STM is the latest “nifty fifty” lens from Canon, replacing the very popular EF 50mm f/1.8 II lens. This lens is designed for full frame Canon DSLR cameras but can also be used on APS-C bodies. When used on APS-C bodies the lens is similar to the field of view from an 80mm lens on a full frame body. That, combined with the incredibly low price makes this lens extremely popular as an entry level portrait lens. Image quality is very good as 50mm lenses are quite simple designs optically. The f/1.8 max aperture is a little soft, but very usable, especially for portraits. This was the other area that the old lens needed help. The older lens was also called the “plastic fantastic” due to it’s very cheap feeling build quality. I have heard stories of photographers claiming the lens would fall apart in their hand, although I think there was mishandling involved in those cases. That said, the build quality of the old lens did not inspire much confidence. The new lens now has a metal mount and feels much better built. Every Canon DSLR owner who wants to get serious about learning photography should own this lens. At around $135 this lens is very inexpensive and offers a lot of bang for your buck! I recommend this lens heartily over the EF 50mm f/1.4 USM most of the time. The 49mm filter thread is an odd size for Canon and I wish that they had kept the 52mm filter from the older lens. That said, however, 49mm filters are quite inexpensive or you can use stepping rings, although stepping rings make using a lens hood difficult. based on 1436 user reviews online.